Do your parents live far away but love to talk the kids? The Facebook Portal is the perfect gift. They can call you through Facebook messenger and see and hear you loud an clear. The best part is that the camera moves with you. So if grandma goes over to the kitchen to get a cup of coffee, the screen pivots and makes adjusts her voice so you can see and hear her. If you have little ones, the camera can follow your baby as they take their first steps! This is also a great gift for military families. For a limited time over the holidays, Portal and Portal+ are available for $50 off with Portal at $149 and Portal+ at $299 Available for purchase on portal.facebook.com, Amazon and Best Buy. -This is a great device from Facebook that comes either in a 10-inch or 15-inch widescreen display. -It has advanced AI technology and Amazon Alexa built right in. – Smart Sound enhances the voice of whoever is talking, no matter where they move. -Supports group calls of up to seven on any Messenger-enabled smartphone or tablet. -Portal’s Story Time brings bedtime stories to life as augmented reality (AR) effects transform your face and voice into the story’s characters before your loved ones very eyes. Mom and dad work so hard all year long. Why not treat themselves to a little relaxation with these amazing home massagers. 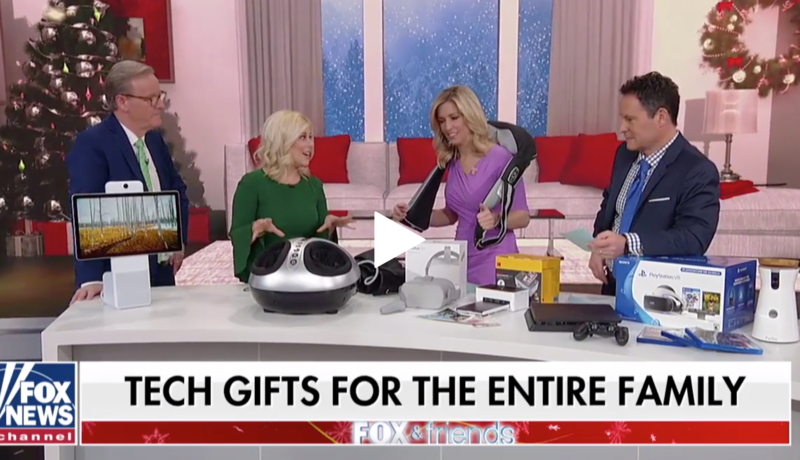 The neck massager can actually be charged so you can take it with you on car the ride if you are visiting friends or family for the holiday. truMedic’s InstaShiatsu + Foot Massager with heat gives you a deep tissue foot massage in the comfort of your home. Using a combination of rollers, airbags and heat, the ergonomic and unique design complements your foot structure and provides a relaxing, enjoyable foot massage. What teen does not want their very own VR system. They can visit Oculus Rooms, travel around the world with Wander, or get closer to their favorite sports team through NextVR, FOX Sports VR and NBA League Pass. My son had his friends over this weekend and they went crazy for this! Oculus Go gives you front access to the best LIVE concerts, games, comedy shows and must-see entertainment through Oculus Venues. Oculus Go offers 1,000+ apps – from immersive entertainment apps like Oculus TV, Netflix, YouTube, and Hulu to exciting games like Catan VR, Covert, Thumper and educational experiences like Space Explorers. Are all those fabulous pictures stuck in your camera? Now you can print them easily and put them in frames with the Kodak Doc! Kids can look forward to titles exclusive to PS4, including Knack II, MLB The Show 18, and Ratchet & Clank. With more than 80 million units sold through worldwide, PS4 will continue to be the home of exclusive PlayStation franchises, blockbuster third-party titles and unique and creative games from innovative developers—making PS4 the best place to play. For the teens in your home, Marvel’s Spider-Man lets gamers become a more experienced Peter Parker who’s more masterful at fighting big crime in New York City. At the same time, he’s struggling to balance his chaotic personal life and career while the fate of millions of New Yorkers rest upon his shoulders. Swing through vibrant neighborhoods and catch breathtaking views of iconic Marvel and Manhattan landmarks. Use the environment to defeat villains with epic takedowns in true blockbuster action. PlayStation VR is a virtual reality system for PS4 that enables gamers to experience a deeper level of immersion and a true sense of presence within the virtual worlds of their games. PS VR demonstrates the future of gaming. Furbo Dog Camera is the world’s first treat tossing camera designed specifically for dogs. If you know a pet lover this is the perfect gift! Doggie Diaries– You will receive a 60-second timelapse of highlights from your pup’s day. Combining digital and physical, the Wilson® X Connected Official Football and mobile app provide five exciting game modes while tracking each throw for real-time stats.